“It is a far, far better thing that I do, than I have ever done” said Mr Anode to the propeller..
As part of the winter refurb, I have replaced Drumler’s sacrificial anode. 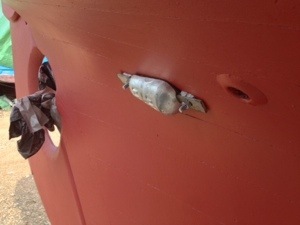 It’s basically a lump of zinc that is bolted onto the hull, not far from the propeller. You can see it in the photo above. But what on earth does it do? Apparently, any time you have two different metals that are physically connected (like the propeller blade and the propeller shaft), as soon as they are immersed in sea water, the salty water triggers a chemical reaction which starts generating a small electric current. The electrons that make up that current are supplied by one of the metals giving up bits of itself, in the form of metal ions, to the sea water. This process is called galvanic corrosion and the most common casualty is a bronze or aluminium propeller in a stainless steel shaft – where, if left unchecked, the prop shaft would basically slowly dissolve whenever the boat is in the water. So that’s where the sacrificial anode comes to the rescue. The way to counteract galvanic corrosion is to introduce a third metal into the ‘electric circuit’ – in this case, a lump of zinc – which is quicker than the other two to give up its metal ions. The zinc anode ‘sacrifices’ itself to protect its propeller housing buddies. So far, so clear. 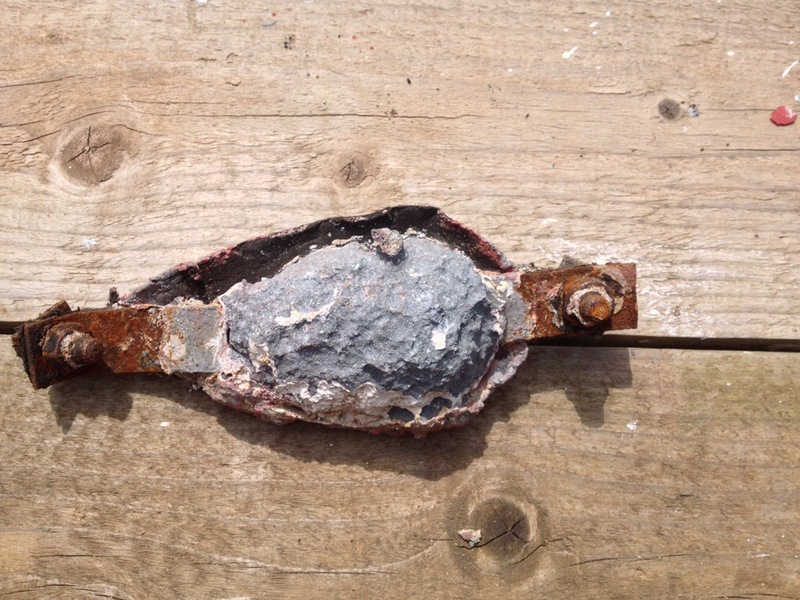 Here is my old anode – pretty spent, so it’s clearly been working. Now here’s the thing: apparently you can’t just put a lump of Zinc in the general vicinity of the propeller (or rudder) and hope that it will step forward and sacrifice itself. It needs to be connected to the metals it is there to protect, so as to form an electrical contact. Apparently the conductivity of water is not adequate to create a circuit. So, the question is: what is the anode on my hull meant to be doing, given that it is stuck on about three feet away from the propeller? 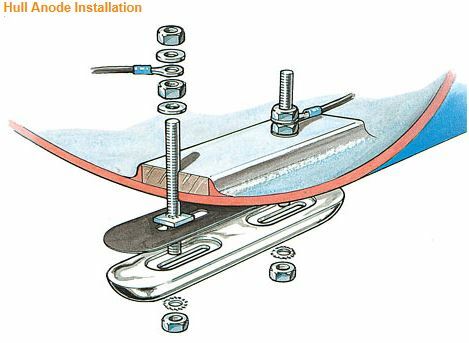 Detail of how to fit an anode, showing electric wiring inside the hull.